Residential segregation by race and ethnicity is a longstanding challenge in the United States, with the racial and economic geography of communities throughout the nation remaining deeply shaped by the legacies of segregation and exclusion. While the extent and nature of discrimination have changed in recent decades, the imprint of these divisions remain visible in many cities, creating the foundation that continues to define and influence choices aobut where people of different races and ethnicities live. 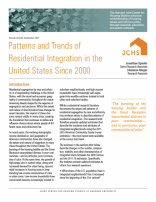 In recent years, the evolving demography, income distribution, and geography of American communities have also changed the extent and nature of integration in many cities throughout the United States. The bursting of the housing bubble and the Great Recession exacerbated distress in poor communities—and in particular, poor communities of color. At the same time, the growth of high-wage jobs in central cities, along with increased demand for urban living, spurred rapid increases in housing costs in longstanding low-income communities of color in urban cores. Low-income households have concurrently become increasingly located in suburban neighborhoods, and high-income households have increasingly self-segregated into wealthy enclaves located in both urban and suburban locales. While a substantial research literature documents the extent and patterns of residential segregation by race and ethnicity, less evidence exists to describe patterns of residential integration. This research brief therefore presents updated estimates that describe the incidence and attributes of integrated neighborhoods using 2011-2015 American Community Survey 5-year estimates—the most recent data available at the census tract level. The analyses in this brief describe changes in the number, composition, stability, and other characteristics of integrated tracts between the 2000 Census and the 2011-15 estimates.